Englanninkielinen opasvihkonen. Korteissa tekstit 6 eri kielellä.Roberto de Angelis reproposes the icons of the Rider-Waite deck using modern strokes and graphics.Faithful to the esoteric symbolism proposed at the beginning of the twentieth century by the great English occultist, each Arcanum is interpreted through a precise pictorial key, offering immeadiacy and depht to divining. Englanninkielinen ohjevihkonen. Korteissa tekstit 6 eri kielellä.Floral images soft and elegant lines created by modeling color, forms and time.New styles and images are added to those which we already have in our imagination, causing us to re-experience the spirit of revival of the twenteeth century and to recall spring like atmosphere of colour and rebirth. Korteissa tekstit 6 eri kielellä. Mythical Avalon, home of the chivalrous legends of King Arthur and his knights, comes back to life in these beatiful cards with a fantastic medieval setting: a world of light and darkness which reflects contemporary civilization. 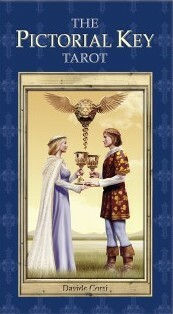 Good and bad are continuously compared in the Avalon Tarot, a game with Christian and pagan symbols. The deck, disigned in a young and aggressive style, was directly inspired by the thirteenth-century French tradition. 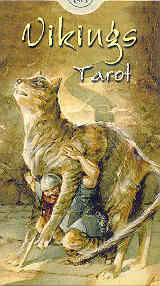 Englanninkielinen opasvihkonen.Korteissa tekstit 5 eri kielellä.This Tarot, with its mystical forms, contains both poetic and existential messages. Infinite emotions are revealed in the delicate lines of tempera nad pastels, as if imprisoned in the fragile outline of a stained-glass window.Touching these crystalline figures means entering a world of pure beaty and love. Korteissa tekstit 5 eri kielellä. Fomori, Tuatha dé Danan, Ulaid, Fienna... these are the names of the main descentants of heroes talked about the legend of the Celts. These cards tell about the feats of that ancient people whose close relationship with the spiritual dimension of nature was only recently re-evaluated. 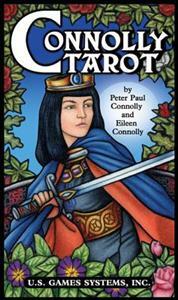 The Celtic Tarot leads us on a wonderful trip through symbols and legends which are always contemporary. Englanninkielinen opasvihkonen.Korteissa tekstit 5 eri kielellä.The work of Carlo Della Rocca, one of the most important engravers of the nineteenth century, was reproduced precerving the charm and naturnalness of the extremly refined craft.This deck is one of the best examples of Tarot art, its origins deeply rooted in the Italian culture and history.Each Arcanum contains own divinatory meenings. Painted in tempera on papyrus, these cards were partially inspired by the Tarot created by the famous occultist Jean-Babtiste Pitois in 1870. 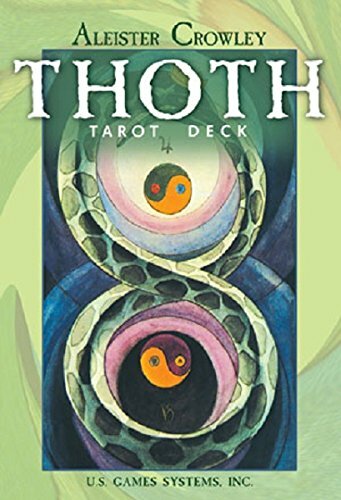 According to Pitois, the Tarot came from legandary Book of Thooth, a knowledgeable book which have held all of the mysties of Egyptian magic. 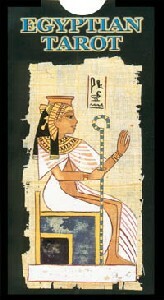 Light of Egypt and enigmatic queen whose beaty was legendary: this is Nefertari. 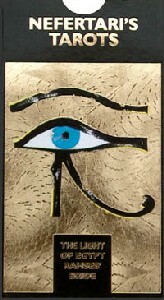 This precious Trot includes the mysteris of the Nile valley as seen through her timeless eyes. With valuable golg printing, this is the most opulent Egyptian Tarot ever created. Distant relatives of the gnomes, the fairies are very playful beings, who carry out naughty jokes and times. The fairies, however, also like to help humans in very practical ways...like these cards. 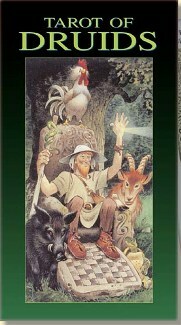 The fairy Tarot is actually enchanted: it allows reality to be confronted using a positive attitude, it helps play down all kinds of troble and easily overcomes problems objectively. 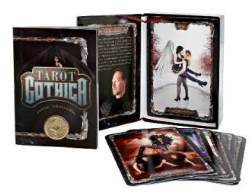 Published by Lo Scarabeo, the box describes these cards as beautiful, elegant and rebellious, the teen witches walk among us. 78 Arcana with cool instructions. The introduction in the little white book is written by Carl Wesche Llewellyn and rhapsodises about Wicca and Witchcraft, but, incongruously, there seems to be little in the deck that is more than superficially associated with those beliefs. 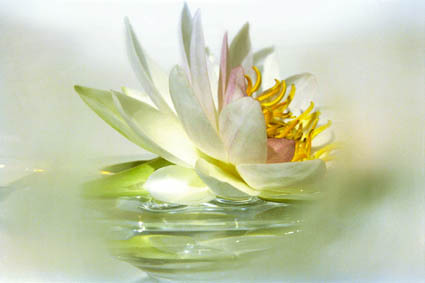 The deck idea is credited to Laura Tuan, creator of the Spirit of Flowers Tarot and the Angel Voices Oracle. The deck art is by Antonella Platono and has a colour-saturated, cartoonish, Disneyish quality. 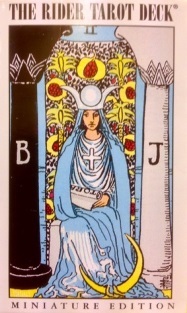 The people in these unusually glossy cards are also uniformly young, lithe and beautiful, all barring the High Priestess Hierophant, Hermit & Death. Dressed in split skirts, bustiers, bikinis, hot pants and matching boots, they are happy, fun loving and lively …the young at heart, new to the road of life. Embodying the stereotypes of witches old and new, pointy witches hats and witches on broomsticks are everywhere. 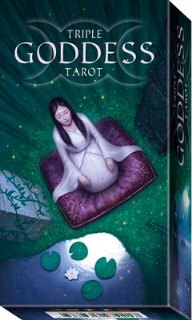 The classical iconography of the Tarot is reinterpreted in this deck through the mythology of the Vikings, the people of the North. They were voyagers, colonisers and warriors, heroic people whose destiny was guided by Odin and marked by the Runes, awaiting the relentless Ragnarock. These cards awaken a symbolic dimension to be explored. The equilibrium of destiny always assume changing forms that to a distracted eye, involved in daily life, can seem to be without sense or meaning. To search for harmony, the right sense of proportion and balance in events, means entering into syntony with our past, present and future. 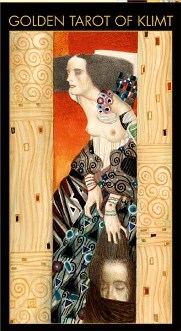 In the Vienna of the early 20th century that was rich with new movements – intellectual, aesthetic and psychological – that contributed to the formation of modern man, the art of Gustav Klimt held a primary position. These Tarots, inspired by the Master, are enriched with impressions stamped in hot-gold and recount love and death, sensuality and regeneration. 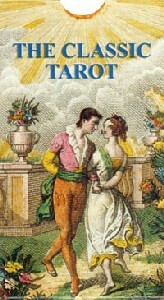 The first tarot deck inspired by Madame Lenormand, the most famous cartomant in history. 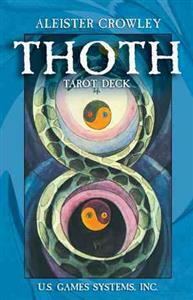 The images come from the Book of Thoth by Etteilla and from the oracle cards by the same Lenormand. Thanks to the simplicity of these Tarots and their actual intuition, a key to read the present, past and future can be found. Instructions Languages: I, Uk, F, D, Es. 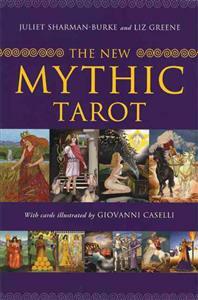 The Initiatory Tarot of the Golden Dawn has been created from documents from the occult group. The deck artist was without any knowledge of their previous decks, so the result is comic-book style illustrations with familiar elements in new interpretations. 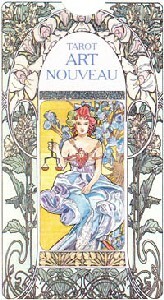 In a novel addition there are two extra cards, duplicates of Strength and Justice with reversed numbering so the reader can choose their preference. This is the message: Follow the cycle without end of the sacred Sabbat, encounter the Great Goddess, the Horned God and the Maiden, the Mother and the Old Woman. 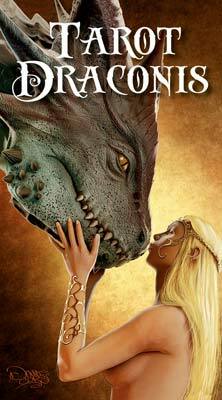 Come and discover the secrets of love and of loving relationships. 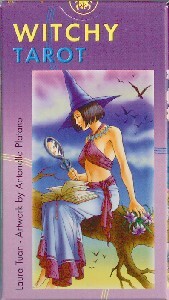 Here, then, is what is hidden in the depths of the Wicca Tarot of Sensuality. 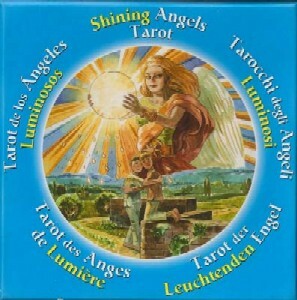 These lovely images appear on round cards, reminding us that angels surround us in a circle of love and protection. Let these angels provide gentle comfort and sweet encouragement. 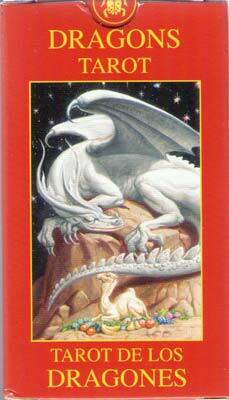 If needed, fierce protection and unyielding strength are available here as well. 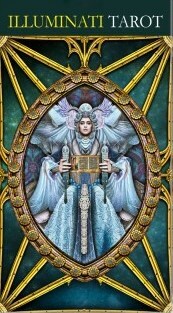 Bring the power of heaven to your life on Earth with the Shining Angels Tarot. 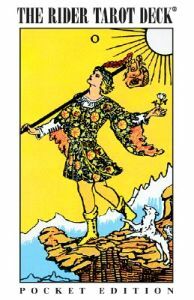 In the Pictorial Key you will recognize the images, the symbols and the universal meanings of the Tarot as never seen before. These avant-garde realizatons are so innovative and real that they almost bring the Arcana to life. The Pictorial Key possesses an effective, evocative power and is a tool that can open our inner temple. Distant relatives of the gnomes, the fairies are very joyful beings who play naughty jokes at times. The fairies, however, also like to help humans in very practical ways… like through these cards. 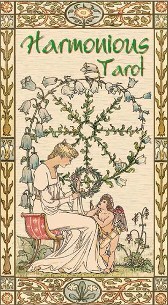 The Fairy Tarot is actually enchanted: it allows reality to be confronted using a positive attitude, easily playing down all kinds of trouble and overcoming problems objectively. SUURIKOKOISET THOTH KORTIT noin 14 x 8.5 cm Undertaken in 1938, and completed in 1843, this deck assimilates Crowleys inspired ideas on restructuring the traditional pictorial symbolism of the ancient wisdom of tarot. 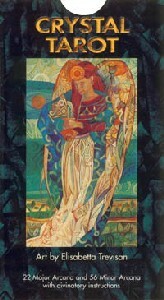 Lady Frieda Harriss color-drenched Art Deco interpretations clarify and augment Crowleys intricate esoteric theories. This premiere edition includes the small 80-card deck (cards measure 2 7/8 by 4 3/8), plus a 20 by 17 spread sheet, and a 48-page instruction booklet by James Wasserman. 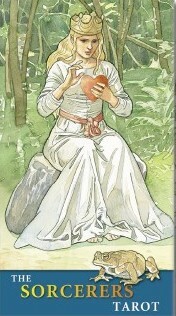 ALSO included are 3 versions of the Magus card by Lady Harris! 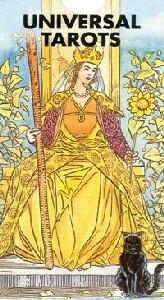 In 1909, Arthur Edward Waite encouraged Pamela Colman Smith to produce a tarot deck with appeal to the world of art that would have significance behind the symbols and thus make the deck more important than tarot packs previously used for centuries. 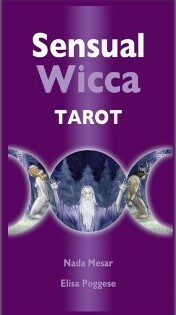 The result was the unique Rider-Waite tarot deck which has endured as the world's most popular 78-card tarot deck. 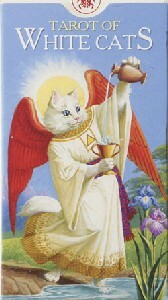 The innovative cards, including the 56 Minor Arcana, depict full scenes with figures and symbols. 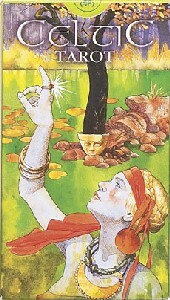 This feature, combined with Pamela Colman Smith's ability to capture the subtleties of emotion and experience, has made the Rider-Waite Tarot the basis for the designs of many century decks. The world's most popular deck! 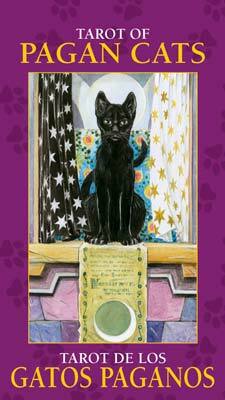 The full color, 78-card taint by Pamela Colman Smith has long been a favorite among tarot enthusiast. Accurate color tones on each card. English titles. 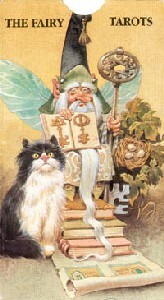 Crowley Thoth Tarot cards based upon original paintings by Lady Frieda Harris. Includes instruction booklet. 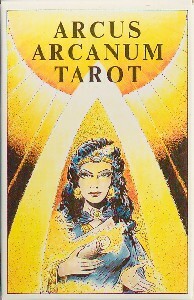 From the time of its first publication in 1986, "The Mythic Tarot "has sold over a million copies in dozens of countries. 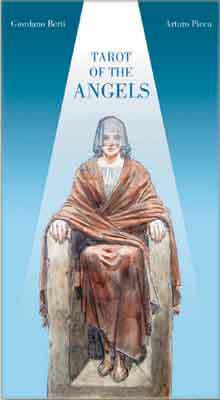 Now, for this twenty-fifth anniversary edition, the text has been revised, brought up to date and the deck completely reillustrated by internationally renowned artist, Giovanni Caselli. 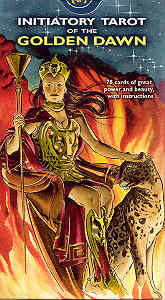 "The New Mythic Tarot "brings together all the elements that made the original version such a necessary deck for all tarot enthusiasts a deck that depicts the gods and goddesses, heroes and heroines of the Greek myths and a book that helps the reader explore them as familiar archetypal characters, whose experiences mirror the shifts and patterns of daily life. 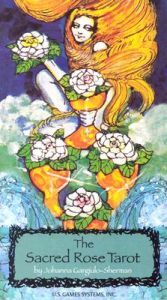 The Sacred Rose Tarot is a standard Tarot deck that has had some Qabbalistic symbolism added to the colourful artwork, inspired by medieval stained glass and Byzantine icons. Suitable for readers of any level. The spiritual and inspirational imagery in this 78-card tarot deck by Peter Paul Connolly will touch your subconscious in a profound way. 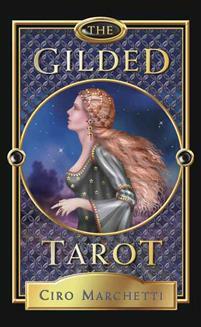 The brilliantly colored tarot deck that has been popular for decades is now presented in a charming keepsake tin. For Radiant Rider-Waite, the artwork of Pamela Colman Smith has been updated and enhanced with a vibrant palette of colors, bringing new energy and radiance to the familiar scenes of 78 cards. 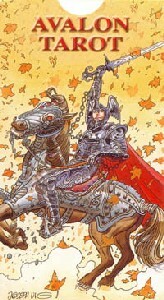 Radiant Rider-Waite's brightness and subtle shading highlight the traditional symbolism that readers rely on for insightful readings. The card backs feature a star-filled deep, blue sky. 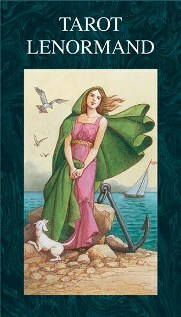 Radiant Rider-Waite Tarot includes an instruction booklet with an Introduction by Stuart R. Kaplan. 78 cards and booklet. Let your spirit and imagination enter into the sacred symbolism of the Freemasons. 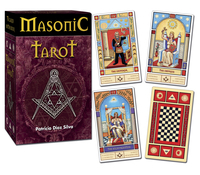 With inspired art by Chilean artist Eduardo Patricio Diaz, this deck acts as a gateway into the secret mysteries of the soul that have been incorporated into Masonic rites for generations. Corresponding to the four elements of alchemy—earth, water, fire, air—this deck is a work of integration and interaction for deep self-knowledge.